Properties in Notre-Dame-de-Sanilhac average 4.7 out of 5 stars. At the gates of Perigueux, 6 hectare property with swimming pool. Property 8: At the gates of Perigueux, 6 hectare property with swimming pool. 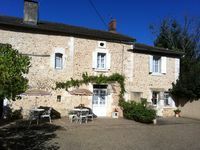 Property 15: Gite with Private Garden and Pool with Stunning Views, don't delay, book today! Property 16: Comfortable and pretty two rooms in quiet and historic area. Property 18: Detached house with terrace, gd land, quiet. Property 25: Beautiful house ... next village! garden! Property 33: Large independent studio. Superb peaceful setting, stunning views. Property 35: Peaceful Dordogne location, nature lovers paradise.